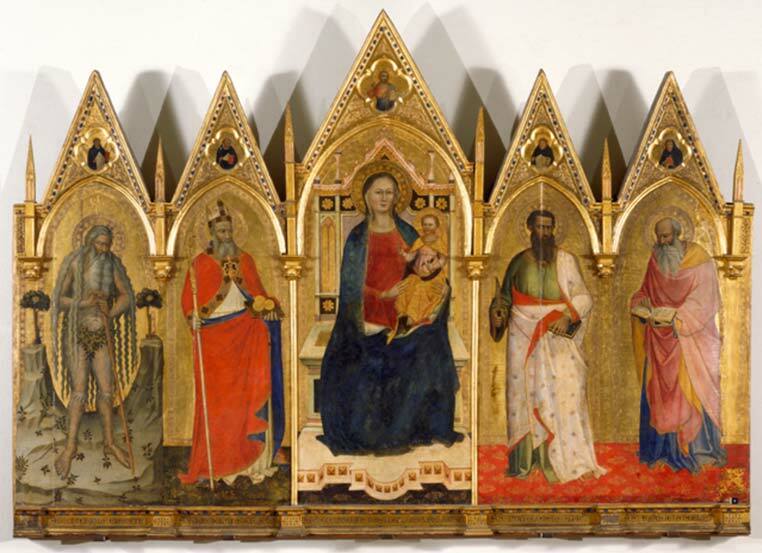 This wonderful polyptych is the work of the painter Giovanni Bonsi, who lived in Florence and was active 1351-1371. Unfortunately, little is known about his life, but it is believed that he completed his apprenticeship at the Orcagna workshop. In 1366, together with Taddeo Gaddi, Orcagna, and Andrea di Bonaiuto, he was part of the Commission for the building of the new Cathedral. Few of Bonsi’s works are known, but this polyptych is undoubtedly the most important one. In the central panel, the Virgin Mary is represented with the baby Jesus on her lap. She sits on a decorated and chiselled throne of gold. An inscription at the bottom of the painting reads that the piece was created in 1371 by Giovanni Bonsi from Florence: AD MCCCLXXI JONES BONSI DE FLORENTIA ME PINSIT. Four saints are represented in the side panels. On the left, St. Onofrio the Eremite, stands with long hair, grasping his stick between two tree-topped rocks. Then there is St. Nicholas, in Episcopal dress, with three spheres of gold in his hand. On the right side of the Virgin, St. Bartholomew is shown with a knife in his right hand and a book in his left. By his side, St. John the Evangelist is depicted writing. The name of each Saint is written in the predella below. Pictured in the cusps above each of the four saints are small gilded portraits of Dominicans. The scene above the Virgin Mary is of Christ blessing a book. This painting is expected to be returned on display in the Painting Gallery. The Washington Chapter adopted the restoration of the Polyptych with Madonna, Child, and four Saints in 2015 at a cost of $50,000. If you wish to make a donation to this particular project please visit the Donate page.